Louise Profeit-LeBlanc is from the Nacho Nyak Dän First Nation in northern Yukon. Growing up in the small village of Mayo, Louise was nurtured by the traditional stories told by her grandmother Ellen Profeit, a masterful storyteller. Many more elders shared their stories with Louise, and early on she dedicated herself to storytelling and to the promotion of Indigenous stories. 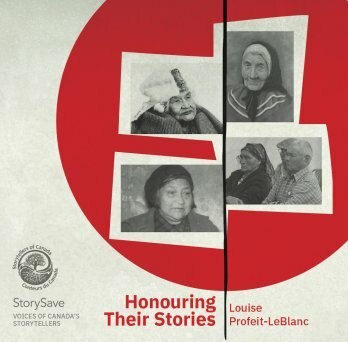 This recording honours those ancestors who ensured that these important stories were passed down orally from one generation to the next, a rich cultural practice, inherent in all Indigenous cultures.Honouring Their Stories is also an extension of Louise’s work of protecting and sharing these stories and helping to retain the language, culture and ancient teachings for future generations. As a part of Louise's album recording, the StorySave team created an audio documentary about Louise's life and work. You can learn all about the stories behind Louise's stories, in the documentary The Wealth of Elders, which is available on demand in the player below. You can also download the piece for free on CD Baby - find it at this link. To buy Louise's album on CD, visit her page in our online Shop. You can also buy a download of her album on CD Baby. Just click here.